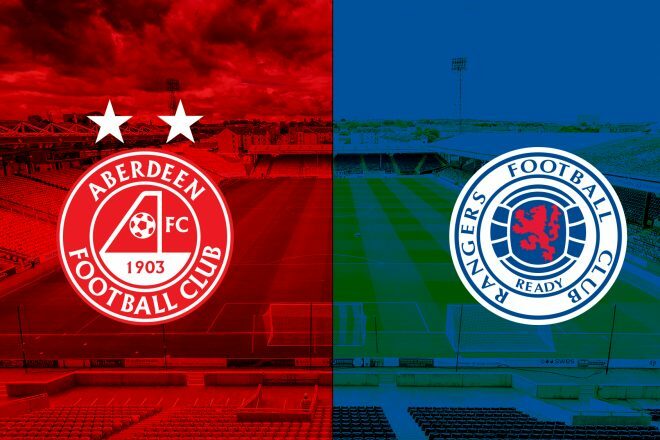 Aberdeen and Rangers lock horns for the fourth time this season with The Dons aiming to take the unbeaten streak against the Glasgow side to five. 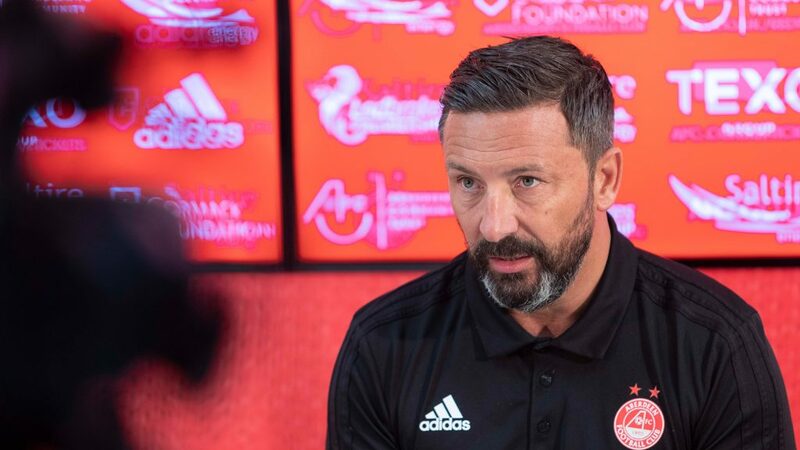 Derek McInnes has managed to get the better of his counterpart Steven Gerrard so far this season and The Dons enter the game full of confidence after Saturday’s excellent win at Easter Road. The Gers go into the match off the back of three successive wins in the league and cup and it’s tight at the top with only two points separating the sides. Rangers are six points behind leaders Celtic. Manager Derek McInnes and Captain Graeme Shinnie spoke with the media ahead of Wednesday’s match at Pittodrie. “A win just means another three points and where we want to go to. We could have dropped to fifth if we didn’t get the right result on Saturday so wherever we are in the league for now it’s not that important. “We want to go above Rangers tomorrow because that shows we’ve won the game, but it’s not the most important game. The most important thing is just trying to win the game regardless of where that takes us. We just want to try concentrate on the game. There’s enough on this fixture as we all know about for the supporters and it’s important we have calm heads. “We’ve played without any fear (in these fixtures) and have taken the game to Rangers as much as we can. Those results are gone though and this is a whole different ball game. We are where we are in the league and it’s one we’ve got full focus on and one we’re looking forward to. “No matter what team you come up against it’s about trying to stop what they are good at and exploit their weaknesses. Tomorrow night will be no different and it’s a game we want to stop their strengths and put our stamp on the game and do what we’re good at. We need to make sure our standards are right up there. Wednesday marks the fourth time Steven Gerrard will bring his team to face The Dons this season and it’s the men in red that have came up with the big moments to deny the Ibrox club. Gerrard’s first match in Scotland saw a mouth-watering opening day clash with Aberdeen at Pittodrie. 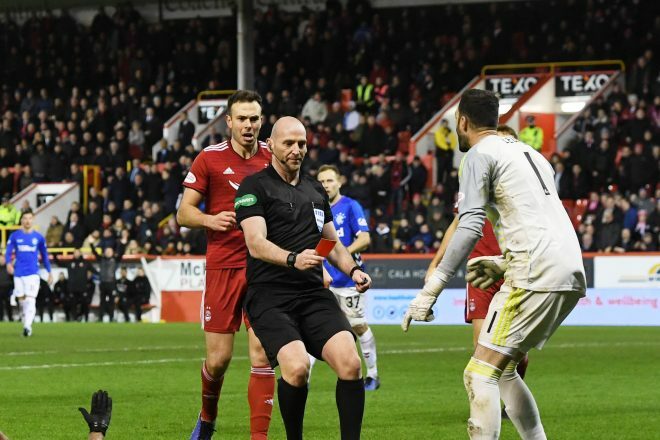 The season was barely underway when Alfredo Morelos kicked out at Scott McKenna, which was spotted by the linesman and the referee brandished a red card to the striker. Despite the advantage in numbers, The Dons couldn’t break Rangers down and James Tavernier converted a first half penalty to give the visitors the lead. Aberdeen couldn’t find a way past a resolute Rangers until the 92nd minute when Bruce Anderson, on his debut, found space inside the area and fired home to earn a dramatic point. The sides would meet again in the Betfred Cup Semi-Final at Hampden at the end of October. Once again it was a nervy affair with both teams carving out little opportunities. Although Rangers had much of the possession they were unable to convert and they were made to pay. 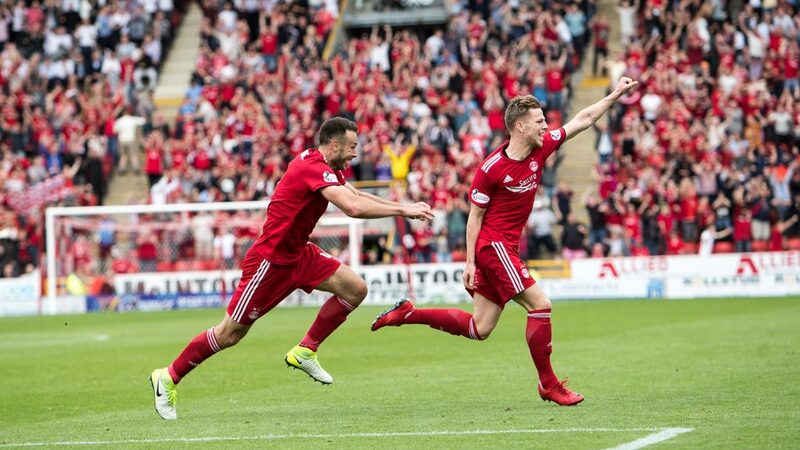 The Dons won a corner with around ten minutes to play and Niall McGinn’s inswinger was headed home at the back post by Lewis Ferguson sending the Red Army fans behind the goal into a frenzy. The Dons were disciplined from there on out and stood firm to book a return to the national stadium for the final. The most recent clash came under the lights at Ibrox back at the start of December. After the Hampden disappointment in the cup final against Celtic, The Dons remained in Glasgow to prepare for the match three days later. The game needed a big player to step up and Scott McKenna gave Aberdeen the perfect start when he volleyed home from close range inside ten minutes. Their character was tested later in the first half when Sam Cosgrove was controversially sent off after a tackle on Golson in the Rangers corner. Rangers failed to cause any real threat in the Aberdeen final third and Alfredo Morleos made it an even harder task when he saw red for catching Shinnie with a flailing arm in the second period. Aberdeen would hold on for their second win at Ibrox under Derek McInnes, which started an excellent month of December. Under Derek McInnes little has separated The Dons and Rangers. He has seen his side produce four wins over the Ibrox side compared to Rangers’ five and there have been two draws, which have both came at Pittodrie. 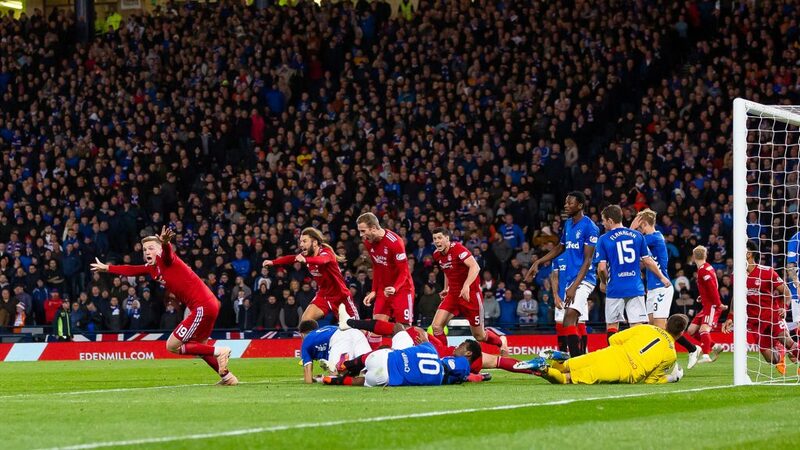 The last Aberdeen win at home to Rangers came in September 2016 when James Maddison curled home a wonderful free kick in the dying embers of the match to give the hosts three points. 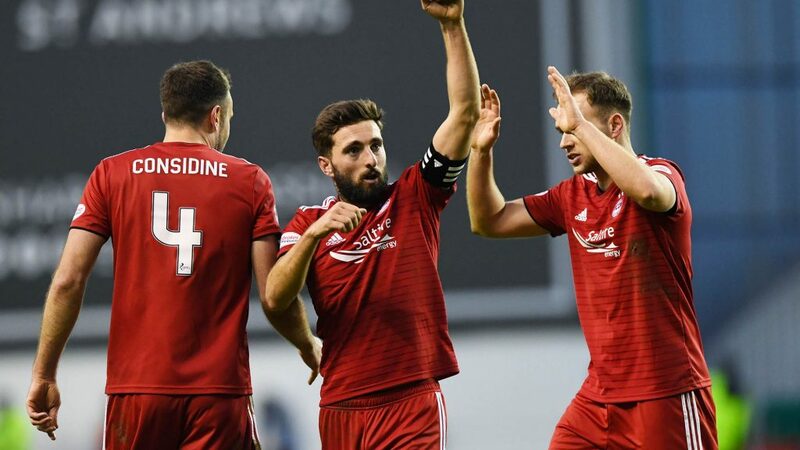 Later that season McInnes would become the first Aberdeen manager in 25 years to see his team win in Govan after goals from Graeme Shinnie and Ryan Christie produced a 2-1 win, much to the delight of the travelling Red Army. Last season saw Rangers win three out of the four meetings, including back to back victories at the end of November/start of December. On the penultimate match of the season the match finished 1-1, which took the race for second to the final day and The Dons secured the runners up place with an excellent 1-0 win at Celtic Park. If you can’t make the game then be sure tune into our RedTV coverage from 7.30pm. UK subscribers can listen in as Dave and Andrew are joined by former Don Stuart Duff, while International supporters can watch live video of the match. Post-match we will have reaction, goal action, highlights and a full match replay. Aberdeen missed the chance to leapfrog Rangers into second place as they came off second best in a six-goal thriller at Pittodrie. The Dons made one change to the side that won away at Easter Road at the weekend – Stevie May dropping out to make way for Scott McKenna in central defence. The visitors made three changes with high profile January signings Steven Davis and Jermaine Defoe dropping to the bench along with Nikola Katic. Goldson, Candeias and Ryan Jack the men in to replace them. Meeting for the fourth time this season both teams came into the game full of confidence and with just two points separating the teams at kick-off it was all set for a cracker. It was a nervy opening few moments for The Dons and immediately they were on the back foot as the away side won an early corner which eventually came to nothing. Greg Stewart had the first half-chance for the home side. The ball dropped to him on the edge of the area but he swung at it and blazed his effort wide. Minutes later, the forward found himself in almost a carbon copy of the same situation after some good work down the left-hand side. Unfortunately, Stewart lacked the composure to get his shot on target and the visitors were let off. Morelos had a golden chance to open the scoring for The Gers. A long ball over the top allowed Ryan Jack to wriggle in behind. His cross ricocheted off a few red shirts before dropping to Morelos who dragged his shot inches wide of Joe Lewis’ left-hand post. The warning signs were there for The Dons and after twenty minutes Rangers took the lead. Ryan Kent found half a yard in the box and managed to get a shot away. Lewis could only parry it out to the feet of Morelos who diverted the rebound into the empty net. The Dons responded well and bounced back with a couple of consecutive corners, keeping Rangers pressed back in their own half and pushing for an equaliser. And on the half-hour mark, Aberdeen got what they deserved and levelled through top scorer Sam Cosgrove. GMS and Stewart combined well down the right-hand side. Stewart’s cross was headed out to Ferguson who caught it sweetly on the volley. Much like the Rangers goal, the ball ricocheted kindly and fell to Sam Cosgrove who calmly swept it past McGregor to level the tie. The lead didn’t last long though and five minutes later Rangers regained the advantage through Morelos. Kent again the provider as he played in the striker on the edge of the box. The Colombian shifted onto his left and curled past Lewis into the far corner. The evening went from bad to worse for The Dons as Rangers were awarded a soft penalty just before the break. From a set-piece the ball took a slight nick off a blue shirt and flew up hitting the out-stretched arm of Scott McKenna. Referee Bobby Madden showed no hesitation in pointing to the spot. Although his arm was in an unnatural position, the call seemed harsh as it was entirely accidental. Joe Lewis guessed the right way but James Tavernier’s shot had too much power on it and he couldn’t keep it out. No changes were made at half time by either side and the second half got underway – a big effort needed from The Dons. McInnes got a reaction from the players and within 90 seconds The Dons had one back. GMS did well down the left-hand side to win a corner straight from kick-off. From the resulting set-piece, James Tavernier was penalised for pulling down Lewis Ferguson in the penalty area and Madden pointed straight to the spot. Cosgrove made no mistake, his spot kick straight down the middle hitting McGregor’s leg on the way past. Rangers nearly regained their two-goal cushion straight from the restart. Morelos again found himself in through on goal after being played through by Tavernier. The forward had plenty of time but Lewis was out quickly to cut the angle and save well with his feet to deny the Colombian his hat trick. Both sides were forced to play out the remaining half hour with ten men after a coming together between McKenna and Morelos. The pair collided in the corner with arms and legs flying everywhere. Morelos ended up in a heap on the floor and after a lengthy conversation between referee and linesman, the pair of them were given their marching orders. In the search for an equaliser, Derek McInnes made the tactical change bringing on striker James Wilson for Shay Logan. His counterpart in the opposite dugout followed suit and brought on Defoe for Candeias. Candeias was booked for taking his time coming off before Arfield joined him after blatantly stopping a counter-attack as The Dons looked to break. James Wilson was making an impact off the bench, cutting in from the left-hand side. The striker had a couple of shots at goal which unfortunately for The Dons lacked the power and finesse to trouble McGregor. Ferguson joined the growing list of players in Madden’s book after catching McGregor in a 50/50. The Dons were pressing hard for an equaliser enjoying the majority of possession but Rangers were holding firm as the game entered the final 10 minutes. The final throw of the dice – McGinn on for Max Lowe. His first action was to deliver a whipped corner onto Stewart’s head. The ball ricocheted off a number of red and blue shirts before falling to Shinnie who hit it straight at McGregor who saved instinctively from point-blank range. Seven minutes of time were added on by Bobby Madden but unfortunately, it wasn’t to be for The Dons. Aberdeen through everything at Rangers in added time but left themselves vulnerable at the back, with Rangers and Jermaine Defoe capitalising on this in the dying embers of the game -adding a fourth goal and rubbing salt in the wounds of Aberdeen. Next up for The Dons will be Queen Of The South at Pittodrie in the Scottish Cup this Sunday.